It must be worth more than it sold for in the past, right? In many cases, YES. But sometimes NO. Let’s talk through some things to consider when pulling comps and noticing a previous sale. I find many of these points coming up lately in conversation, so I hope this is helpful. 1) Context: Previous sales can be powerful sometimes because they help us see how a property has historically fit into the market. In other words, we get to see context. What were the comps at the time of the sale? Here’s an example where a home sold three times at a very similar price position in the market. When I see something like this I can get clues into comps and where this one might fit into the market today. Click thumbnail to see larger image. 2) Unique property: Sometimes when a property is unique though a buyer might have been willing to pay more than what current buyers will pay. Thus a prior sale doesn’t always paint the perfect picture for value. For example, a home in Granite Bay sold for $4.7M in 2013 and then $4.2M in 2018 despite the market showing hefty increases over the years. Thus we have to be careful not to give too much weight to a previous sale while ignoring current comps. 3) Unicorn buyer overpaid: Buyers overpay sometimes – especially if they’re paying cash. I can think of a property that sold at a lofty level a few years back and it’s been re-listed for a while now without any bites. In this case I wouldn’t give any real weight to the previous sale because it looks like it represented a unicorn buyer at the time rather than the market. 4) Appraisal waivers: One thing I’m watching is appraisal waivers. 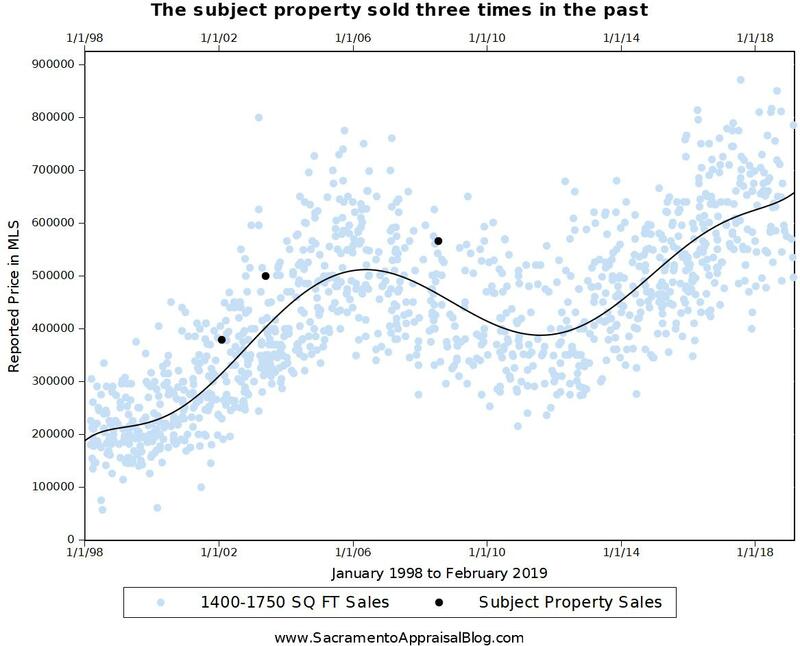 If there was no appraisal on a property and it ended up selling too high, the previous sale likely means very little for value. 5) Inflated & distressed: When a sale took place in an inflated market (like 2005) or a distressed market (like 2007-2009), I tend to give very little weight to these sales. I’m going to look at them and probably even graph them, but I might take them with a major grain of salt. 6) Neighborhood change: One of the things we need to consider is how neighborhoods have changed over time. In other words, it’s possible the market would look at a property differently today than the past. This is especially true with gentrifying neighborhoods, so I better be careful about giving too much weight to older sales. 7) Slower market: Previous sales sometimes remind us the market is slower. I find owners today often expect massive value increases from two years ago, but comps might not be astronomically higher since price appreciation has been slowing. We just haven’t had recent 20% increases like we did in 2013. 8) Not penalizing because it sold too low: If a property sold too low in the past, it shouldn’t penalize the value for today. This is why appraisers have to take a previous sale with a grain of salt and not give too much weight to it. Let’s remember value is found in the comps – not in a previous sale. VIDEOS: If you need some background noise, here’s two videos. The first is a presentation to Realtors and the second is a Q&A after a talk I gave to investors.